In 2008 I had the opportunity to acquire an Egan Portable Irish Harp in Canada, and the instrument’s main parts were still intact and structurally sound. 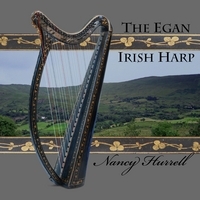 As a harp consultant for the Museum of Fine Arts, Boston, I have experience re-stringing and playing two other historical harps of a similar age in the collection, and one of them is also an Egan Irish harp. At the museum, historically correct stringing charts were calculated for the harps using thinner stringing than on modern instruments. The museum harps were also tuned to a lower pitch (A=415), and after each gallery demonstration, the harp’s soundboard was carefully monitored, and the strings were once again slackened. On my own harp, a few missing parts needed to be replaced before stringing the instrument. The MFA’s Curator of Musical Instruments, Darcy Kuronen, recommended I contact master piano conservator, Tim Hamilton, who works on the museum’s historical keyboards. Tim replicated and replaced two brass ring stops (small rings at the top of each string which turn to fret the strings for key changes), and he also hand carved a complete set of ebony string pegs (original pegs were missing) whose function is to secure each string into the soundboard. I re-strung the harp using historical string gauges and a low pitch (A=415) and finally heard the sound of my Egan harp for the first time. Although difficult to describe in words, the terms ‘clear’, ‘bright’ and also ‘old’ seem to convey the harp’s unique timbre. The thin spruce soundboard, rounded back soundbox, and the use of Irish oak for the base block, all contribute to the special tone quality. The treble almost ‘glistens’ and the thicker dry resonance in the bass octave sounds ‘old’ - quite unlike a modern harp. As a harp historian, I understand how the music from the period is perfectly idiomatic to the instrument played at the time. To find music specifically arranged for my Egan harp, I visited the Library of Congress and also the British Library in London to consult rare music collections published by the harp maker’s son, Charles Egan. The pieces in the C. Egan books range from Irish tunes to light classics and opera themes, and as I played them, I heard how perfectly the musical style fits the harp’s clear articulation and short resonance. The expressive sentiments in the music and the harp’s delicate timbre unlock the sound world of another time and culture, bringing to mind the romantic scenes in Jane Austen novels in which a gentleman suitor instantly falls in love with both the harp sound and the harpist!